Three people have been arrested after a plethora of weapons were seized by police in Kirklees last night. A hammer, a hunting knife and a kitchen knife were among the tools taken from a vehicle that failed to stop for officers. A number of weapons were seized from a car in Kirklees last night. Later that evening a man in his 40s was stabbed to death in Oakes, near Huddersfield. The incidents are thought to be unrelated. A photograph of the weapons was included in a tweet by PS Rebecca Calpin, who said: "These weapons were seized from 3 people arrested after a failed to stop last night.... later in the evening the same officers were guarding a murder scene as a result of a stabbing. "Knife crime is a very real and present threat which needs to stop." It follows a number of incidents in North Kirklees this month. One saw a Batley shopkeeper receive minor injuries after wrestling a would-be robber from his Branch Road newsagents. 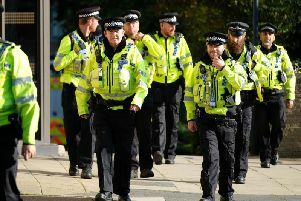 A teenager was charged with possession of a bladed article after an incident at Spen Valley School in Liversedge.